I cannot make resolutions, and I definitely can't make them for an entire year. 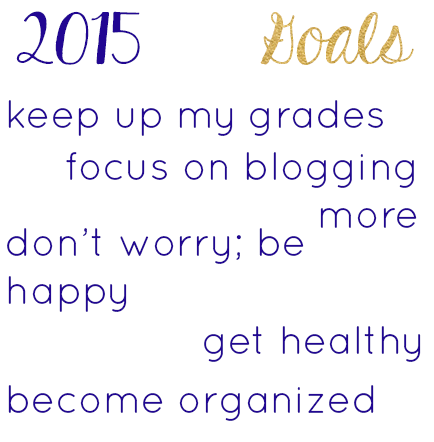 Instead, I divide my year into sections, so here are my goals for the first semester of 2015. A lot of my goals are focused on me and kinda getting my life on track. One of my friends had a Semester of Valerie, and hers was more about focusing on herself rather than guys, but my Semester of Julianna will be focused on feeling better and becoming a better person. Keep up my grades | I am finishing my junior year, and I really want to finish strong. I've had good grades for the past five semester, and hopefully I can keep that up because these are my last grades for college applications. Focus on blogging more | Admittedly I haven't been a good blogger. I've been a horrible blogger actually. I want to focus a lot on maintain this little piece of the internet. I don't have football this semester, so I will definitely have more time to spend working. Don't worry; be happy | This will kind of be the motto for this semester. I haven't really worried about whether or not I was happy this past semester which is weird I guess. I want to focus on myself these next couple of months. Get healthy | This isn't just about physical health, but this includes mental, spiritual, and relational health. Become organized | Obviously the most cliched, but I always focus on this at the beginning of the year to start it off right.